Ok, so now that we know about climate change, what are we going to do about it?!? Here are some ideas! American 5th graders show lots of ways to reduce air pollution to slow down climate change. 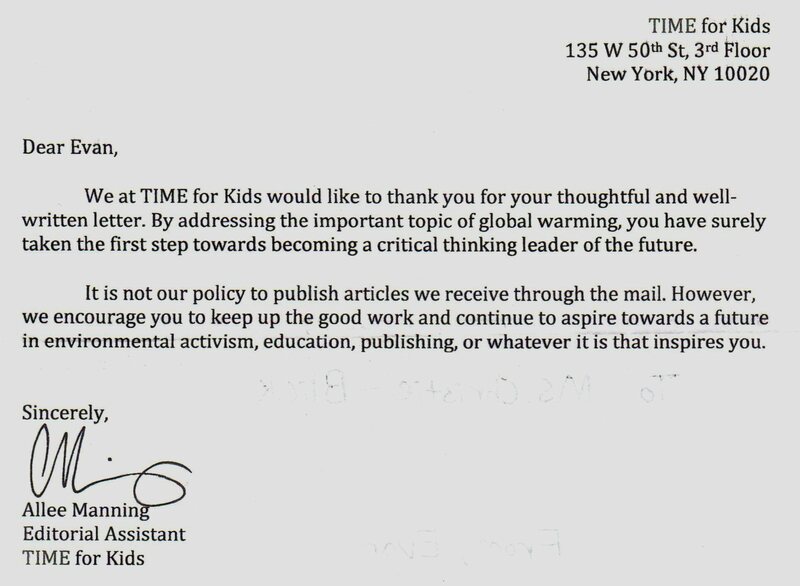 Letter to Evan USA from Time for Kids editor. Click to enlarge. 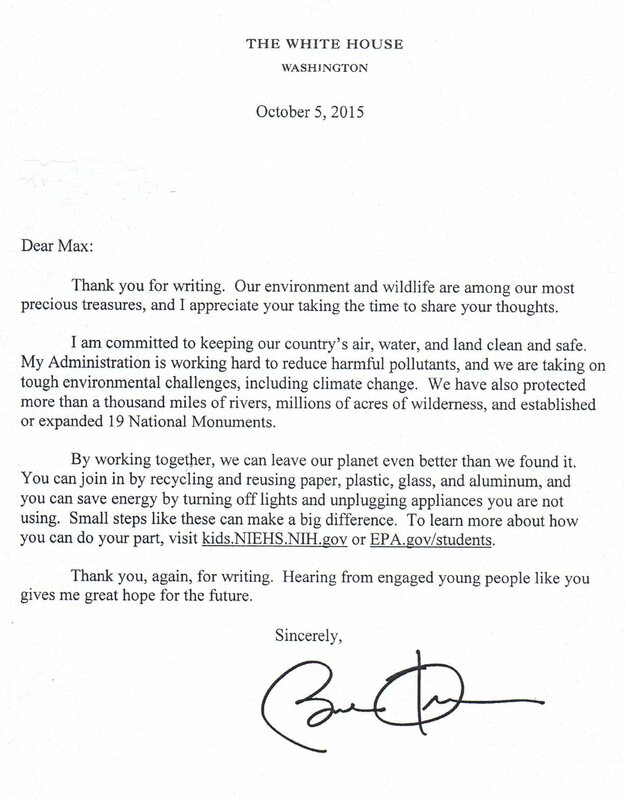 Letter to Max USA from President Obama. Click to enlarge. American students show the importance of recycling at school. 5th Graders in the United States created a pin for servers at local restaurants to wear. 5th graders perform their original music composition, telling the story of climate change. With thanks to Kasia Witek for filming at the school assembly. American fifth grade students meet with New York Assemblywoman Jaffee to discuss climate change. What are YOU doing to help slow down climate change?!? 191 Responses to What Can Kids Do? Kids can unplug their chargers to their devices, to save energy. Use a scooter for transportation. Take short showers and turn off the water while you put shampoo/conditioner into your hair. Plant native plants and plants you don’t have to water or fertilize. Turn off the lights during the day unless you really need them. Turn the heat/air conditioning down one or two degrees every month. Speak out about climate change. Turn off the lights/heat/air conditioning whenever you are asleep. Hand wash dishes if they don’t have spit on them (bowls, plates – not silverware or cups). Rewear cleanish clothes – don’t just throw everything into the laundry. Buy local goods – trucks, ships, and airplanes that carry your food to you all contribute to climate change. Use solar power for little things, like charging your device, if your house doesn’t get enough sun to make going solar a good choice for you. Chlildren could also reduce climate change by planting more treesand plantd. Actually it’s seems a little bit impossible to stop using a polluting vehichles such as cars, bus, motorcycles, and anyelse. Wind power slows down climate change. That’s why Andrew Cuomo put them in the ocean and on land. Andrew Cuomo supports slowing down climate change. That’s why he spent over 15,000,000,000 on slowing it down. Bike/walk to school, using cars use alot of CO2, keep the world clean, the pollution in China is so bad you can’t see the clouds, help save the world. I think everyone including adults and kids should always recycle and even if you do not have a recycling bin at home you can make a trash bin into one, by putting a piece of paper on a trash bin that says recycling.